COPD is a progressive lung disease that makes breathing difficult due to partially obstructed airflow into and out of the lungs. It results from an inflammatory and destructive process in the lungs stimulated by exposure to toxins, primarily due to a history of smoking cigarettes. For most people, breathing is unconscious and perceived as effortless. Yet, for many older adults with COPD, breathing requires a conscious effort. Because of this added effort, patients can increase their resting energy expenditure (REE) by 10% to 15%.4 As a result, if they do not compensate for their increased energy needs by adding more calories to their diet, they will lose weight. • side effects of medications. The purpose of nutrition care for this population is to provide adequate energy to minimize the risk of unwanted weight loss, avoid loss of fat-free mass (FFM), prevent malnutrition, and improve pulmonary status. Research shows that COPD is a disease that not only affects the lungs but can also have systemic consequences, as well as result in severe weight loss and FFM depletion.7,8 Combined, loss of weight and FFM can adversely affect breathing by reducing the strength and function of respiratory and skeletal muscles. In addition, a low body mass index (BMI) is associated with a poor prognosis; therefore, patients must maintain energy balance in light of their increased caloric needs. The risk of malnutrition, which the American Dietetic Association (ADA) defines as a BMI of less than 20 kg/m2, is a common concern among patients with COPD who lose an excessive amount of weight and FFM. Malnutrition can impair pulmonary function, increase susceptibility to infection, lower exercise capacity, and increase the risk for mortality and morbidity.6,9 According to the American Thoracic Society, criteria for initiating caloric supplementation is a BMI of less than 21 kg/m2, involuntary weight loss of more than 10% during the previous six months or more than 5% in the previous month, or depletion in FFM or lean body mass. FFM depletion is defined as below 16 kg/m2 for men and 15 kg/m2 for women based on the FFM index (FFM divided by height squared). For those patients who are overweight, added pressure on the lungs can increase the effort required to breathe, so encouraging patients to safely lose excess weight is important. 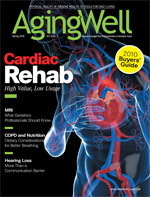 Although the research is not sufficient to conclude that antioxidant therapy can slow COPD’s rate of progression, findings indicate that the consumption of fresh fruits and vegetables is positively associated with improved pulmonary function, fewer symptoms, and possibly reduced oxidative stress.8 Keeping in mind that elders may develop vitamin and mineral deficiencies due to reduced dietary intake is also important. Many patients with COPD are prescribed glucocorticoids to help reduce airway inflammation and improve breathing. However, one of the side effects of glucocorticoid use is bone mass loss and eventual osteoporosis, leading to an increased risk of fractures. Several risk factors can cause osteoporosis, and patients with COPD typically have many of them, such as the use of glucocorticoids, smoking, vitamin D deficiency, low BMI, malnutrition, and decreased mobility. According to a study in the February 2002 issue of Chest that examined the impact of COPD on osteoporosis development, 36% to 60% of patients with COPD eventually develop osteoporosis. For this reason, patients who are starting a long-term inhaled or oral glucocorticoid therapy are encouraged to supplement it with calcium and vitamin D since bone loss occurs rapidly upon initiating treatment. According to the ADA’s 2008 practice guidelines for COPD, at-risk patients should take at least 1,200 mg of calcium and 800 to 1,000 IU of vitamin D daily to minimize bone loss. A July 1993 study in Chest found that a high-fat diet (55% fat) would be more beneficial to patients with COPD than a high-carbohydrate diet (55% carbohydrate) because it would decrease carbon dioxide production, oxygen consumption, and RQ, as well as improve ventilation. However, there is not a general consensus in the literature to universally recommend a high-fat, low-carbohydrate diet, as it may not be necessary for stable patients and not all patients may be able to tolerate the potential side effects (eg, gastrointestinal and abdominal discomfort, belching, diarrhea). In addition, some patients may have a coexisting heart condition that could make a high-fat diet contraindicated.6 In fact, 25% of COPD patients develop pulmonary hypertension due to low oxygen levels, resulting in enlargement and thickening of the right ventricle of the heart, a condition known as cor pulmonale. Therefore, according to the American Dietetic Association’s Manual of Clinical Dietetics, it is best to replete energy needs but avoid overfeeding as “excess calories are more significant in the production of carbon dioxide than the carbohydrate to fat ratio.” Because both overfeeding and carbohydrate metabolism produce high carbon dioxide levels and expelling excess carbon dioxide puts an enormous burden on the already-stressed lungs, it is best to meet but not exceed energy needs to keep both carbon dioxide and RQ levels in check. Protein needs should be assessed on an individual basis. Intake should be high enough to stimulate protein synthesis, prevent muscle atrophy, and maintain lung strength but should not contribute excess calories to the diet. The general rule of thumb is about 1.2 to 1.7 g/kg of protein daily, or approximately 20% of total caloric intake. As for fluids, patients who are not on a fluid-restricted diet should be encouraged to drink liquids (2 to 3 liters per day) to keep mucous thin and help clear the airways. There is still debate as to the effectiveness of nutrition therapy in improving anthropometric measurements, lung function, and exercise capacity in patients with COPD.9 According to the Global Initiative for Chronic Obstructive Lung Disease, nutrition supplementation coupled with exercise may increase efficacy. Although exercise is probably the last thing most patients with breathing problems want to think about, engaging in regular exercise has been shown to improve overall strength and endurance, reduce symptoms of dyspnea and fatigue, improve cardiovascular function, and contribute to stronger respiratory muscles and improved breathing.1,3 In addition, well-conditioned muscles use less energy, which can help stabilize REE levels. — Ilaria St. Florian, MS, RD, is a freelance food and nutrition writer currently based in Martinique. She holds a master’s degree in nutrition education from Teachers College, Columbia University. • Eat meals when energy levels are at their highest, which is usually in the morning. • Eat several small, nutrient-rich meals to avoid becoming breathless while eating. • Eat slowly and chew foods thoroughly to avoid swallowing air while eating. • Choose foods that are easy to chew. Modify food consistency if mastication seems to increase fatigue while eating. • Choose foods that are easy to prepare to conserve energy for eating. • Limit salt. Consuming too much can cause the body to retain water and can make breathing more difficult. • Eat calcium- and vitamin D-rich foods to support bone health. • Prepare meals that appear palatable and well presented. • Avoid foods that cause gas or bloating. A full abdomen can make breathing uncomfortable. • Eat while sitting up to ease lung pressure. • Drink liquids at the end of the meal to avoid feeling full while eating. • Wear a cannula while eating if continuous oxygen is prescribed. Eating and digestion require oxygen, so the body will need the extra oxygen. • Limit caffeinated beverages, as caffeine can interfere with some medications and cause nervousness or restlessness. • Make the meal more enjoyable by engaging in social interaction while dining. • Avoid aspiration by breathing carefully, swallowing, and sitting properly and with good posture while eating. 1. Pauwels RA, Buist AS, Calverley PM, Jenkins CR, Hurd SS. Global strategy for the diagnosis, management, and prevention of chronic obstructive pulmonary disease. NHLBI/WHO Global Initiative for Chronic Obstructive Lung Disease (GOLD) Workshop summary. Am J Respir Crit Care Med. 2001;163(5):1256-1276. 5. Wouters EFM. Nutrition and metabolism in COPD. Chest. 2000;117(5 Suppl 1):274S-280S. 6. American Dietetic Association, Dietitians of Canada. Manual of Clinical Dietetics, 6th Edition. Chicago: American Dietetic Association; 2000. 7. Ferreira IM, Brooks D, Lacasse Y, Goldstein R. Nutritional intervention in COPD: A systematic overview. Chest. 2001;119(2):353-363. 8. MacNee W. Treatment of stable COPD: Antioxidants. Eur Respir Rev. 2005;14(94):12-22. 9. Ferreira IM, Brooks D, Lacasse T, Goldstein RS. Nutritional support for individuals with COPD: A meta-analysis. Chest. 2000;117(3):672-678. 10. MacNee W, Rahman I. Oxidants and antioxidants as therapeutic targets in chronic obstructive pulmonary disease. Am J Respir Crit Care Med. 1999;160(5 Pt 2):S58-S65.